Physically, FOTOCAT is an Excel spreadsheet of UFO and IFO cases where an image has been obtained on photo, film or video. It contains various data columns to register the date, time, location, province and country, explanation (if one exists), photographer’s name, special photographic features, references, etc. When completed, the full catalogue will be posted in internet, for an indiscriminate access to the worldwide UFO community. Another milestone has been exceeded. Our present case base stores now 7,170 reports. Colleagues from several countries and national regions are working in close liaison with FOTOCAT Project to develop their national or local censuses to ensure that all known reports are entered into the catalog as soon as possible. For the first time since 2000, when we launched this endeavor, we have established a final target number for FOTOCAT. Future projects in mind advise that this current job cannot be perennial. We have decided to stop the catalog (at least in a first phase) when the count for 1900-2005 arrives to 10,000 entries. It leaves still ample room for acquiring sighting data from your own regions. Do not delay any cooperation with us so that you guarantee that your local events are recognized and included into the largest photographic inventory in the world. “The Year 1947 in Photos” is the new project that has just commenced, scheduled for completion for third quarter of 2007. I am now teaming up with a great partner, Barry Greenwood, a famous historian of the UFO phenomena, author and one of the most experienced and knowledgeable UFO researchers in the United States. The cooperation that FOTOCAT Project is finding in the international arena is extraordinary and it will be reflected in the final study. Maurizio Verga (left) with Vicente-Juan Ballester Olmos, France, 2005. Thanks to the invaluable and disinterested aid from long-standing Italian researcher Maurizio Verga, his full catalog of photographic reports in Italy (PHOTOCAT) is being merged with FOTOCAT. Maurizio’s present records cover 1947 to 1998 and amounts to 562 entries, while our own inventory contains 400 cases for this country. Therefore, I expect this may bring some 200 additional events to FOTOCAT. This major example of international cooperation will contribute to maximize the current panorama of UFO sightings in Europe within FOTOCAT. The Chilean UFO association Canopus from Valparaíso and his leader Marcos González (working on his thesis for the M.S. degree in Meteorology by the Valparaíso University) are an important source for sophisticated, high-quality data regularly submitted from Chile. In an effort to cooperate with us, they have collected some 150 photographic cases in Chile (FOTOCAT has already 220 for that country) and we are now in the process of adding the new information to our records. I am confident that several dozens of unknown cases will be feeding into our catalog. Several countries and regions are under special scrutiny. With the able assistance of local specialists, a full review of the photo cases of the concerned areas is being carried out under the optics of this Project. At the end of the day, we hope to reach definitive records of the reported UFO activity in those parts of the world, as far as images are concerned. We invite other ufologists who can contribute to draw the most complete panorama of photographic UFO sightings from other countries, provinces, regions, states, etc. 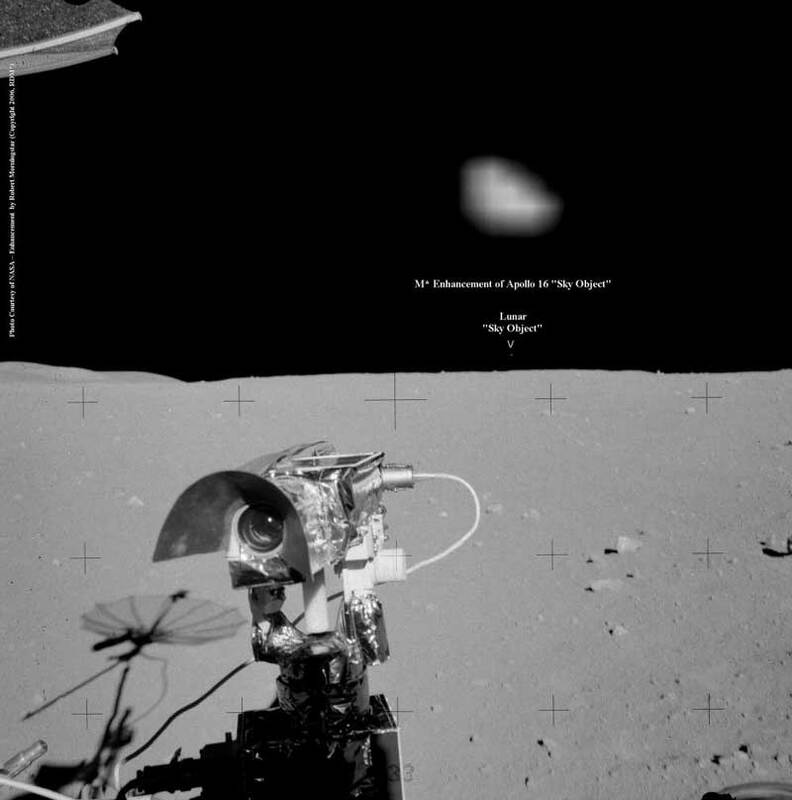 (c) Robert D. Morningstar upon a severely augmented blob in an Apollo 16 picture. Because it reunites two of my curiosities in ufology, photos and astronaut sightings, I decided to take a look to this seemingly impressive photograph. One feels a strange sensation about a discovery of this nature: in spite of the apparent fact that there was an astronaut taking photos at a UFO over the Moon, it had to be discovered many years later by an aficionado looking at old NASA pictures. One week after the release I consulted Mr. Morningstar about the date of the photograph, to check, and he did not know at that time. He kindly wrote: “My research was conducted on a very large NASA photo made from the original negative and stored on the NASA Apollo Image archive.” Frankly, it made me think that not an actual research on the circumstances the picture was actually being obtained had been made. Let us provide some details: The Apollo 16 mission on the Moon lasted 72 hours, with a landing on April 21, 1972 and a return take-off on April 24th. During the mission there were 3 extravehicular activities (EVAs). 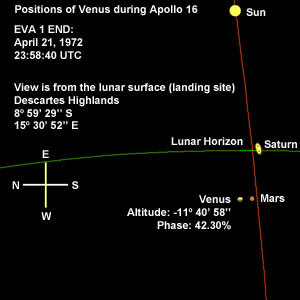 Frame #17761 was taken by astronaut Charlie Duke during EVA-1, on April 21, 1972, an activity which started at 16:47:28 and ended at 23:58:40 (UTC). After following it up with Terry, he produced for me the following graphic that shows the position of 3 planets at the end of EVA-1 as seen from the Moon. Venus and Mars were under the horizon and, therefore, they could not be visible. © NASA. Original photograph AS-16-109-17761 (high resolution). Charlie Duke during EVA-1 on April 21, 1972.© NASA. 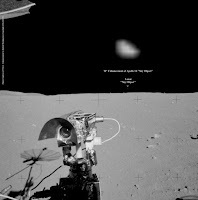 Oberg notes: “Just seeing the nature of the imagery –hand-held off the hip documentation from the bouncing rover as it makes its way across the surface- shows that the author’ s description is total fantasy.” He refers to M* characterization of a photograph centered on a potential astronaut’s interest. Jim Oberg continues: “If you look at the previous and subsequent image, nothing shows up”. 123:02:48 Duke: This seatbelt is great. It seems to be taking it with no problem. (Pause) We are at 6 kilometers an hour now, Tony, 0.4 (km range), still nothing new to report. Maybe more cobbles in this area now. In fact, there are. The regolith is more cobbly in appearance, (the fragments are) still angular. Maybe 40 percent of the surface is covered with cobbles that are 10 centimeters (or larger). 123:03:20 England: Okay. We copy that. 123:03:27 England: And we're right on the timeline. 123:03:28 Duke: We see some small fresh craters, meter size, that show some very fresh...at least...Perhaps it's indurated regolith. That's what it looks like, because the little hard clods are the same inside the craters as on the rim. 123:04:00 Duke: At our 11 o'clock position, we're at 089 for 0.4. We have two very bright, small craters that are 2 or 3 meters across, and we see some whitish material down below in the walls of the crater there. They're about 25 meters off. 123:04:23 England: Okay, Charlie. Those rocks that you collected (at the ALSEP), were they...Were they all breccias, or could you tell (what they were)? 123:04:29 Young: Charlie, you hit my arm. 123:04:32 Duke: I'm not sure, Tony. I think they were breccias, but they were really dust covered, so I couldn't tell you, really. 123:04:40 England: Okay, understand. And have you seen any rocks that you're certain aren't breccias? 123:04:50 Young: (Annoyed) Quit hitting my arm! 123:04:54 Duke: (Answering Tony) Negative. I haven't seen any that I'm convinced is not a breccia. 123:05:03 Duke: Okay. We're going generally west now, and at our 1 o'clock position on a heading of 270 at a bearing...We're (at a bearing to the LM of) 091 at 0.5 (km range); we're in another distinct ray field - ray pat(tern) - 'Ray', let's say, 'boulder field'. We sort of passed out of one, and we're in another one. And we're getting the...Go ahead, John. Now we have seen the picture in its true context, with the actual conversations being held at the time of taking the photos, and the enigma picture placed along the others also taken in the moment. We have to disregard the interpretation (by sheer augmentation) of this picture as anything remotely anomalous. FOTOCAT Project wishes to acknowledge the assistance provided by Terry Groff and Jim Oberg. 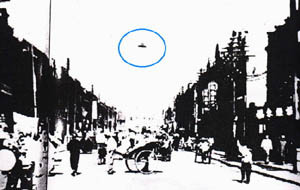 Jun-ichi Kato has proposed a quite reasonable solution to the 1942 picture of an oval-shaped object over a normally-transited street in the location of Tientsien, in the Chinese province of Hopeh. According to the available story, a Mr. Masujiro Kiru was going through his father's photo album from the China Campaign just before WWII when he found a photograph of a flying object. His father, now deceased, had bought the picture from a Tientsien street photographer, apparently right after it was taken. 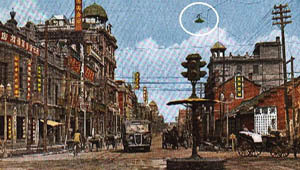 Mr. Kato has found a postcard of a Manchurian city (in the past, North of China, today Kiturin city, Mongolia), taken in the decade of the forties, where the composition of the streets and buildings, including the electric poles along the street and the lamps over the streets and between houses, keep a marked resemblance to the 1942 photograph of an alleged UFO which shape and position extremely looks like the street lamp of the Manchurian city in the same epoch. It seems a common sense explanation. See http://www.our-j.com/ourjtopics2.html. Thanks to Martí Flò for alerting us to this. This section will display a sample of UFO sighting directly reported to FOTOCAT. 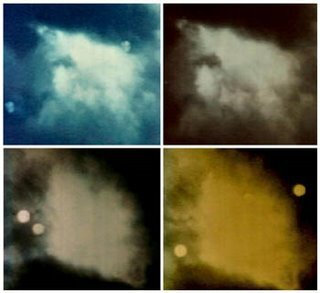 Last July, an email from photographer Vicents Tobenyas Radua, from Barcelona, reported about two pair of stereo pictures he made to the clouds on March 24, 1978. Later on, when he was to project the slides he found in the images two or three spheres and two triangles joined by the base (he did not see anything strange at the time of taking the photos). The pictures were taken at 12 hours from a mount in Vic (Cataluña, Spain) at 1,000 meters height, and the photographer estimated that the clouds cover was between 2,000 to 5,000 meters. Shutter speed was 1/125s and diaphragm was between f8 and f11 (actual data from memory). The original slides are 24 x 22 millimeter and they made an inter-negative over a close-up surface of 5 x 5 millimeter to highlight the finding and made a positive from it. Camera was a Kodak of the fifties or sixties with a mechanic shutter, film used was positive Orwo. Filters were used. Photographs are created in pairs simultaneously. Another anomaly is that considering that the two shutters click at the same time, the spheres appear in different places, therefore the photographer interprets that these were moving very rapidly. Asked about internal lens flares, the expert photographer claims that typical sun flares were hexagonal-shaped. The round spots in the last two are definitely lens flare. Whether it would be hexagonal depends on the aperture setting, which becomes more circular as it is opened wider. If you look at those carefully you can just see that they tend toward hexagonal, particularly the one to the right in the yellow frame. The trio spots in the first frame are not like anything I have ever seen before. If the next frame is the other half of that stereo pair, then it does not show them, making me think that they are not real objects at a distance but some sort of internal camera reflection instead. Lens flare and internal reflections can come in an amazing variety of shapes and sizes. I assume the "triangles joined by the base" refers to the interior structure of the blobs in first (top) pair? I see in each case three approximately triangular sectors joined approximately at their apices (not their bases), somewhat like distorted Maltese crosses each with one arm missing, embedded in a patch of lesser brightness. Two of these objects appear on one photo of the pair; there is nothing at all visible on the other so the question of "motion" does not arise. If auto flash was not used, then the angles would have to be found to work out whether such bright illumination was likely from the sun. Failing that could they possibly be multiple images of the camera aperture scattered by the internal optical surfaces? One would expect the same effect from both lenses with parallel optical axes, but if one lens is filtered or differently coated then possibly the scattering would occur on one photo only. I would favor nearby insects however, since at very close range the FOV of one stereo lens does not intersect that of its partner. The objects in the bottom pair are different, round bright blobs with no internal structure. There are two on one image, three on the other, and no two positions coinciding. They appear almost symmetrically round (apart from a slight flattening of the circumference at a position around 5 o'clock). Differing positions on perfectly simultaneous exposures obviously cannot indicate "high speed" as there is no interval. Such "motion" would be literally instantaneous. If the exposures are not quite exactly simultaneous because of a lag in the mechanism then there could be a very small interval, but if the objects have moved many degrees (as indicated, assuming here an FOV typical of most cameras) during some unknown tiny fraction of a second (the lag), then the angular rate is extremely high and, depending on the unknown shutter speed, one might expect to see motion blurring of the reflective or self-luminous objects in the direction of motion. The similarity of the flattening in the same position on all objects suggests again the possibility of multiply scattered images of the same bright source, as above, possibly with a changed sun angle or exposure. But in this case the wide difference in the positions of the blobs between two simultaneous (or virtually simultaneous) photos taken with fixed parallel optics suggests that the blobs must have different sources unrelated to the camera optics. One might think of insects again, possibly closer to the lens this time and slightly more out of focus (the blobs appear a little larger). At the distance of the background cloud both photos are of the same field of view of course, but the pencils of light rays describing the conical FOV of each lens do not intersect close to the camera, where they are covering different fields of view. This is also the region where depth of field limits would cause focus problems, so the likely conclusion is that these objects too are insects - three insects near one lens, two different insects near the other, all out of focus and scattering either bright sunlight or flash. On the other hand, the similar flattened-circle geometry of each image does not suggest insect structure. We would have to assume that this is an added optical artifact caused by the diffracted image of the lens aperture partially eclipsed by the shutter mechanism. I also don't understand what the photographer means by the images being "within the cloud" or "behind the clouds". It's obvious that if the sources of these lights were "within the cloud" - i.e. huge objects several thousand meters away - then they are UFOs. But there's nothing (as far as I can see) in the photos to establish this. The most interesting information would have been the angular scale, to test the idea of a high-speed motion due to a slight time lag in the two stereo shots, but we still don't have it. At least knowing the exposure is something to go on. Let's take #3 and #4: How wide are these images? It now sounds as though he is saying these images are 5mm square cropped details out of 24x20mm frames. If this is right then assume the full FOV is 30 degrees (reasonable) and say the angular width of the object is 1/18 of the angular width of this cropped area, then we are looking objects about 5/18 = < about 0.3 degree across. We don't know which lights on the pair of photos are images of the "the same" object, but lets say there's a 3 degree displacement (just guessing but in the right range). Now let’s say the delay between the "simultaneous” shutter releases is huge, say a whole second. Then the angular rate of the hypothetical object is 3 deg/sec. 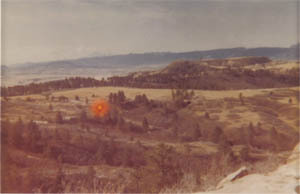 During the exposure stated of 1/125 sec the object would therefore move about 0.025 degrees. This means that during the time the shutter is open the object should move about 1/12 of its own diameter. It would not be "stopped" but would be blurred about 10% of its length in the direction of motion. That ought to be discernable. But the situation is far worse that that because of course a 1 second lag between stereo pairs is ludicrous; not even a crude mechanical coupling could be as bad as that! Let's allow 1/10 second, then the angular rate becomes 30 degs/sec and the above result gets increased by an order of magnitude –that is, the objects would have moved one whole diameter during each exposure. I don't see any evidence that any of these blobs is deformed at all in a way that would suggest motion blurring. In fact the one type of deformation they do show -a flattening of one edge- is identical on all blobs and plainly independent of any individual motions. So on present evidence, i.e. without any other good reason to believe the "objects" are large and at distances of kilometers, I'd rule out motion, and revert to my favored explanation of different image sources - probably scattering sources of bright sunlight - close enough to the camera that they only fall within the conical FOV of one lens or the other, not both. I don't think any further work on this would be fruitful. These do not appear to be distant objects. A meaningful stereo pair has the same objects, separated by some small different distance, in the 2 photos allowing triangulation. There is no hint in these photos as to what aligns to what, so no meaningful triangulation can be done. All blobs are the same size, suggesting mis-focused, small, bright objects such as raindrops, dandelion seeds, or other floating debris, very close to one lens, and out-of-view of the other. Any detail in the blobs will be the same, as seen in the attached comparison of 2 of the blobs. (The detail is dictated by the lens and aperture.) At 125th second and rapid speed, smearing of the objects in the direction of motion would be expected. None is apparent. In conclusion, the international expert consensus calls for a reality not more than virtual for the “UFOs” in the images of this case. There are very few 3D UFO photos in the phenomenology. The first such stereo image was achieved in the winter of 1870 in Mount Washington, New Hampshire. After the Spanish example of 1978, a pair of pictures with a stereoscopic camera was achieved on August 22, 1983 in Poland. The last known stereo photographs known were produced by the infamous Ed Walters (of Gulf Breeze dubious fame) with a NIMSLO camera in February 1988. 1965 jumped in terms of case reporting, 1966 maintained the same high level, to be surpassed by peak year 1967. In the last two years of this period the number of cases decreased, yet keeping a high score compared to the first part of the decade. 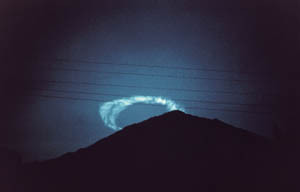 As far as explained versus unexplained events, there is an average 50-50 proportion, one which is roughly constant over the years (+/-10 percent points), with the exception to 1963, a year where 25 of the IFO reports belong to a sole event, occurred on February 28th over Arizona and due to the multiple series of photographs taken of the atmospheric after-effects of the aborted launching of a Thor Agena rocket. Beautiful picture taken by Ray Stanford from Phoenix, Arizona, at 18, 05 hours of February 28, 1963. Ray clearly identified the ring’s cause. In addition to realize the marked American accent of the records (40% of all cases from USA), FOTOCAT has made special compilation jobs with Argentina, Australia, Italy, Chile and Spain, what would explain their input levels. The present country frequency ratios do not necessarily compare well each other. Highlighted “flap” years (in US Air Force terminology, a condition characterized by an advanced state of confusion) are not a common feature in the various countries concerned. 1967 was the most important year for the United States, 1965 and 1968 were for Argentina, 1961 and 1967 for Italy, 1968 for Spain, 1966 for Great Britain, 1969 for Australia, and 1961 for Japan. Yes, a true state of confusion. By Renzo Cabassi, Roberto Labanti, Edoardo Russo, Massimo Silvestri, and Giuseppe Stilo. Authors and compilers are members of CISU (Italian Center for UFO Studies) and CIPH (Italian Committee for Project Hessdalen). This huge bibliography includes full references to 2,955 entries arranged in a chronological order and published all around the world since 1497 A.D. through 2006.
and Tectonic Strain Theory (TST). This is the largest work ever issued worldwide on these phenomena, and it is the result of some active projects within CISU and CIPH. As a reminder, version 1 of my paper in English appeared in http://www.ikaros.org.es/fotocat1954.pdf. Version 3 was the Spanish translation (including images) in the journal @nomalía (II), 5, May 2005. And version 4 (also with photographs) is the French translation in the annual magazine La Gazette Fortéenne, Vol. IV, 2005, pages 99-133. The various versions represent successive improvements over the initial one. Any dumb can create today a web site or a blog. But not too many of the existing sites merit we lose time on a visit. One such exception is http://kevinrandle.blogspot.com/ , the blog by Kevin Randle that I find personally recommendable to UFO students. Pedro León (left) and Vicente-Juan Ballester Olmos, in the second’s Studio. Last December 1st I had the pleasure to host Pedro León Sistach in Valencia City. Pedro came from Barcelona to spend one day working with me on the investigations we have been doing for some years with researcher Manuel Borraz on a significant UFO incident occurred in Spain in 1985 which involves video footage, Police intervention, radar detection and observations from pilots in the air. The work session was quite fruitful and I hope we can report results in the following months. Otro récord se ha batido. Nuestro censo actual alcanza los 7.170 casos. Amigos y colegas de varios países, en estrecho contacto con este proyecto, se encuentran trabajando en el desarrollo de sus catálogos locales para asegurarse que esos avistamientos formen parte de nuestro vasto catálogo. Después de que en el año 2000 iniciáramos la recopilación de información para FOTOCAT, hemos decidido establecer una cifra que marque el final del trabajo, al menos en una primera etapa. Será cuando alcancemos los 10.000 casos para el periodo 1900-2005. Futuros proyectos hierven en la cabeza de este investigador y no podemos hacer que esto sea algo perenne. Esa importante cifra, sin embargo, deja amplio margen para la cabida de los casos de tu región, provincia, estado, o nación. Te recomiendo, pues, que no retrases cualquier plan de colaboración, para garantizarte que los casos de tu interés local queden registrados e incluidos en el inventario más grande del mundo de avistamientos fotográficos. “El año 1947 en fotos” es el nuevo proyecto que acaba de iniciarse, con el objetivo de que esté terminado para el tercer trimestre de 2007. En esta ocasión tengo un coautor de lujo, Barry Greenwood, un distinguido historiador del fenómeno ovni, autor de libros e investigador con una notable y reconocida experiencia en este campo en los Estados Unidos. La cooperación que Proyecto FOTOCAT está encontrando a nivel internacional es extraordinaria y con seguridad se verá reflejada en el estudio final. Gracias a la valiosísima y desinteresada colaboración del reconocido estudioso italiano Maurizio Verga, su catálogo de informes ovni fotográfico en Italia (PHOTOCAT) está siendo transfundido a nuestro FOTOCAT. En su versión actual, los registros de Mauricio alcanzan 562 casos entre 1947 y 1998, mientras que nuestro propio inventario consigna un total de 400 casos para ese país. Por consiguiente, creo esperar que ese proceso brinde unos 200 informes nuevos a nuestro catálogo. Este relevante ejemplo de colaboración internacional permitirá mejorar el panorama de avistamientos de esta clase en Europa dentro de FOTOCAT. La agrupación chilena Canopus, radicada en Valparaíso, y su líder Marcos González, egresado en Meteorología por la Universidad de Valparaíso, están suponiendo una importante fuente de información precisa y de de alta calidad que recibimos con regularidad de Chile. Para colaborar con nosotros y gracias a su esmerada dedicación, han reunido unos 150 informes fotográficos de Chile (FOTOCAT cuenta con 220 para ese país) y en la actualidad estamos añadiendo la nueva información en nuestros archivos. Confío que varias decenas de casos nuevos pasan al catálogo. Varios otros países y regiones están bajo un escrutinio especial. Gracias a la abierta disposición de especialistas locales, nuestro Proyecto está centrando mayor atención a la casuística fotográfica de dichas zonas. Esperamos que, a su término, lleguemos a reunir censos completos de la “actividad ovni” en tales partes del mundo, en lo que a avistamientos con imágenes se refiere. Invitamos a otros ufólogos –de España y del extranjero- a que contribuyan a dibujar con nosotros una visión exacta de la fenomenología registrada en sus naciones, regiones, provincias o estados. El fondo de la información era que “mientras estudiaba archivos de la NASA de la misión de alunizaje del Apolo 16, el señor Morningstar (M*) descubrió un objeto celeste brillante y luminoso flotando sobre el horizonte lunar en la foto AS-16-109-17761”. Las razones que llamaron la atención de M* fueron “su brillantez, cuando otras estrellas no eran visibles en la foto... y su peculiar forma triangular y no circular como uno esperaría de una estrella, si una fuera visible”. El comunicado de prensa sigue diciendo: “Tras ampliar y mejorar la foto a través de los niveles gamma, el contraste y el brillo...la imagen del objeto celeste parece ser la de un objeto muy grande y muy luminoso flotando sobre la superficie lunar y aparentemente muy distante del horizonte lunar. Ello indicaría que el objeto era muy grande”. (Argumento circular, como ha señalado Martin Shough: “era un objeto enorme, luego debía estar lejano, y porque estaba lejano y parece tan grande, debía de ser enorme”). Composición de Robert D. Morningstar de una mancha ampliada en una foto del Apolo 16. Por último, la información se cierra con esta afirmación: “Cuando uno estudia la foto con ‘ojo de fotógrafo’, uno puede ver que en la composición de la misma el objeto celeste parece ser el punto focal de la atención del astronauta-fotógrafo, cási en el centro de la imagen”. Porque reúne dos de mis curiosidades en ufología, las fotografías y los avistamientos por astronautas, decidí revisar con más interés esta fotografía aparentemente impresionante. Si bien uno siente una sensación especial sobre un descubrimiento de esta naturaleza: a pesar del hecho de que un astronautas estuvo haciendo fotos de un ovni sobre la Luna, tuvo que ser descubierta muchos años más tarde por un aficionado que estaba mirando viejas fotos de la NASA. Una semana después de su difusión, escribí al señor Morningstar preguntándole la fecha de la foto, para hacer mis comprobaciones, y él admitió no conocerla entonces. Amablemente me indicó que “mi investigación fue llevada a cabo con una foto de gran tamaño de la NASA hecha a partir del negativo original y almacenada en el archivo de imágenes del Apolo de la NASA”. Francamente, esto me hizo pensar que mucha investigación no había tenido que haberse hecho sobre las circunstancias en que se tomó dicha fotografía. Es hora ya de dar algunos datos concretos. 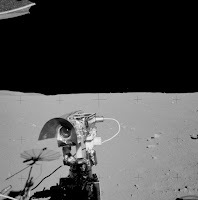 La misión Apolo 16 a la Luna duró 72 horas, con un alunizaje el 21 de abril de 1972 y un despegue de regreso el 24 de abril. Durante la misión se realizaron 3 actividades extra-vehiculares (EVAs). La imagen #17761 fue hecha por el astronauta Charlie Duke durante el EVA-1, el día 21 de abril de 1972, una actividad que comenzó a las 16:47:28 y termino a las 23:58:40 (Tiempo Universal). Esta sensacional noticia acaparó durante unos días las discusiones de la magnífica lista de debate UFO Updates y se cruzaron varios mensajes sobre el descubrimiento. Se avanzó la hipótesis de Venus, pero el estudioso norteamericano Terry Groff descartó este planeta porque “el área iluminada debería haber sido la mitad superior de la esfera venusiana, vista desde la Luna”. Profundizando este asunto con Terry, éste me preparó el siguiente gráfico que muestra la posición de 3 planetas a final del EVA-1, tal como se vería desde nuestro satélite natural. Venus y Marte estaban entonces bastantes grados bajo el horizonte y no podían ser visibles. © NASA. Fotografía original AS-16-109-17761 (alta resolución), Charlie Duke durante el EVA-1, 21 de abril de 1972. Oberg apunta a continuación: “Con ver sólo la naturaleza de las imágenes –documentación gráfica cámara manual en ristre desde un rover brincando por la superficie lunar-, se demuestra que la descripción del autor es una fantasía total”. Se refiere a como M* definía la foto como centrada en un hipotético interés del astronauta por un cuerpo espacial. Jim Oberg sigue: “Si observas las imágenes anterior y posterior, no aparece nada”. El siguiente paso, ahora ya metidos de lleno en la misión Apolo 16, con un rover circulando por la superficie lunar, sorteando cráteres y remontando colinas, podemos consultar la trascripción del intervalo real cuando se tomó la serie de fotografías de la que se ha extraído una con una manchita que, exageradamente ampliada, ha sido convertida en un enigma. Para la lectura de la trascripción de las conversaciones, véase la versión en inglés de este blog o simplemente visitar el enlace anterior. Una vez que se ha visto la fotografía problemática en su verdadero contexto, atendidas las conversaciones reales en el momento de la toma de fotografías, y la foto colocada junto a las otras que se hicieron en aquellos momentos, debemos despachar por falsa la interpretación (por exageración) de esta fotografía como algo ni remotamente anómalo. Proyecto FOTOCAT desea agradecer la extraordinaria información facilitada por el investigador Terry Groff y el técnico de la NASA Jim Oberg. OVNI en China en 1942, ¿resuelto? Jun-ichi Kato ha propuesto una solución bastante razonable a la fotografía de un objeto oval sobre una calle normalmente transitada de la ciudad de Tientsien, en la provincia china de Hopeh, en 1942. Según las informaciones disponibles, un tal Masujiro Kiru halló la foto en el viejo álbum de recuerdos de su padre de la campaña de China antes de la segunda guerra mundial. Aparentemente, su padre, ya fallecido, se la compró a un fotógrafo callejero de Tientsien poco después de tomarla. El señor Kato muestra una postal de una ciudad de la antigua Manchuria (anteriormente norte de China, hoy Kiturin, Mongolia), hecha en la década de los cuarenta, donde la composición de calles y edificios, incluyendo los postes eléctricos y las lámparas sobre las calles y entre las casas, guarda una extraordinaria semejanza con la fotografía de 1942 del supuesto ovni, cuya forma y posición se parece mucho a la lámpara de calle sobre la población china de la época. Está aproximadamente a 1.000 metros de altitud y calculo que las imágenes tomadas reflejan una zona de entre 2.000 y 5.000 metros. Las hice sobre las 12 de la mañana y fue durante una sesión fotográfica sobre nubes. La cámara, una Kodak estereoscópica de los años 50-60 con obturador mecánico y separación entre lentes a la distancia de los ojos. Nos dimos cuenta de las “anomalías” al proyectar las fotografías, ya que se habían tomado en película positiva marca ORWO. Los fotogramas se crean en esa cámara de dos en dos y aparentemente al mismo tiempo e instantáneamente. El tamaño del fotograma es de 24 x 22 milímetros aproximadamente y vista la distancia a la que teníamos que proyectar la imagen, decidimos efectuar un inter-negativo de una zona de unos 5 x 5 milímetros del original y a partir de ahí efectuar el positivado. Las fotos que he enviado están escaneadas a partir de dicho positivado. Cuando estábamos haciendo las fotos no vimos nada especial, solo al proyectarlas nos dimos cuenta de las esferas y los dos triángulos unidos por la base que aparecían. Si las dos imágenes se mirasen con el visor adecuado se verían en 3D, pero también es cierto que ese efecto disminuye con la distancia. Las fotos (diapositivas) las hicimos usando filtros para mejorar el contraste de las nubes (de ahí la coloración ficticia). Probablemente la velocidad de disparo fuese de 1/125s y el diafragma entre f8 y f11. velocidad. ¿Reflexiones internas? Podría ser, pero los reflejos del sol siempre eran de forma hexagonal. Y los reflejos no quedarían por detrás de las nubes. Hasta aquí el relato del fotógrafo, extraído de varios mensajes de correo electrónico subsiguientes. Las manchas redondas en las últimas dos son, definitivamente, reflejos en la lente. Para ser hexagonales depende de la apertura, que se convierten en más circulares cuanto más abierto. Si las miras cuidadosamente, se puede ver que tienden hacia el hexágono, particularmente la de la derecha en el fotograma amarillo. El trío de manchas en el primer fotograma es algo que no había visto antes. Si el siguiente fotograma es la otra mitad del par estéreo, entonces éste no las muestra, haciéndome pensar que no son objetos reales a una distancia sino, en cambio, alguna especie de reflejo interno en la cámara. Los reflejos de las lentes y los reflejos internos pueden aparecer en una sorprendente variedad de formas y tamaños. Asumo que los “triángulos juntos por la base” que dice el fotógrafo se refieren a la estructura interior de las manchas en el par superior. Veo en cada caso tres sectores aproximadamente triangulares unidos por sus ápices (no en sus bases), algo así como cruces de malta distorsionadas, cada una sin un brazo, encastradas en un parche de brillo menor. Dos de esos objetos aparecen en una foto del par, nada en absoluto es visible en la otra, por lo que la cuestión del “movimiento” ni se plantea. Ya que no se usó flash, habría que hallar los ángulos para determinar si tal brillante iluminación era probablemente del sol. Si no, ¿podrían ser múltiples imágenes de la apertura de la cámara dispersadas por las superficies ópticas internas? Uno esperaría el mismo efecto de ambas lentes con ejes ópticos paralelos, pero si una lente lleva filtro o está pulida diferentemente, entonces posiblemente la dispersión ocurriría en una foto sólo. Yo favorecería la posibilidad de insectos cercanos, ya que a muy corta distancia el campo de visión de una lente estéreo no se corta con el de su pareja. Los objetos en el par inferior son diferentes, manchas brillantes redondas sin estructura interna. Hay dos en una imagen, tres en la otra, no hay dos posiciones que coincidan. Parecen casi simétricamente redondas (aparte de un ligero aplanamiento de la circunferencia alrededor de las 5 en punto). Posiciones diferentes en exposiciones perfectamente simultáneas obviamente no tienen que indicar “alta velocidad”, ya que no hay ningún intervalo. Tal “movimiento” sería literalmente instantáneo. Si las exposiciones no son exactamente simultáneas por un retraso en el mecanismo, entonces podría haber un pequeño intervalo, pero si los objetos se hubieran movido muchos grados durante una pequeña fracción de segundo (el retraso), entonces la velocidad angular sería extremadamente alta y, dependiendo de la velocidad de disparo, podría esperarse ver un trazo borroso dejado por los objetos a causa de la velocidad en la dirección del movimiento. La semejanza del aplanamiento en idéntica posición en todos los objetos sugiere nuevamente la posibilidad de imágenes de dispersión múltiple procedentes de una misma fuente de luz brillante, posiblemente con cambio de ángulo con el sol. Pero en este caso la amplia diferencia en las posiciones de las manchas entre dos fotos simultáneas sugiere que las manchas deben tener fuentes diferentes sin relación con la óptica de la cámara. Nuevamente podríamos pensar en insectos, posiblemente más cerca de la lente esta vez y ligeramente más desenfocados. La conclusión probable es que esos objetos son insectos, tres cerca de una lenta y dos diferentes cerca de la otra, todos fuera de foco y dispersando luz solar. Por otra parte, la similar geometría de circulo aplanado de cada imagen no sugiere la estructura de un insecto. Tendríamos que asumir que ello es un artificio óptico añadido causado por la imagen difractada de la abertura de la lente parcialmente eclipsada por el mecanismo de disparo. Tampoco entiendo lo que quiere decir el fotógrafo cuando menciona que las imágenes están “dentro detrás de las nubes”. No hay nada en las fotos que establezca que las fuentes de estas luces están a varios miles de metros de distancia. Tomemos las imágenes #3 y #4: ¿cuál es su tamaño? Estas imágenes están en un cuadro recortado de 5 milímetros a partir de fotogramas de 24x20 milímetros. Podemos asumir que el campo de visión total es de 30 grados y afirmar que la anchura angular del objeto es 1/18 de la anchura angular del recuadro recortado, así que estamos mirando objetos de 5/18 = &lt o alrededor de 0,3 grados de superficie. Digamos que hay un desplazamiento, digamos, de 3 grados. Pensemos que el retraso entre los disparos “simultáneos” es grande, pongamos 1 segundo. Entonces, la velocidad angular del hipotético objeto es de 3 grados/segundo. Durante la exposición indicada de 1/125 de segundo, el objeto por consiguiente se movería alrededor de 0,025 grados. O sea, que durante el tiempo en que el obturador está abierto, el objeto se movería 1/12de su propio diámetro y alrededor del 10% de su dimensión quedaría borroso en la dirección del movimiento. Y ello debería ser discernible. Los objetos deberían haberse movido un diámetro completo en cada exposición. No aprecio ninguna evidencia de que ninguna de esas manchas se haya deformado en forma alguna que indique borrosidad por movimiento. En resumen, la evidencia actual elimina la existencia de movimiento y revierte a mi explicación favorita de fuentes diferentes para las imágenes -probablemente fuentes de dispersión de la brillante luz solar- suficientemente cercanas a la cámara para que sólo caigan dentro del campo de visión cónico de una lente o de la otra, pero no del de ambas a la vez. Éstos no parecen ser objetos distantes. Un par de fotos estéreo adecuadas tiene los mismos objetos, separados por una pequeña distancia diferente, en las dos fotos, lo que permite una triangulación. No hay la menor insinuación en estas fotos en cuanto a qué está alineado con qué, de forma que no puede hacerse ninguna triangulación significativa. Todas las manchas tienen el mismo tamaño, lo que sugiere pequeños objetos brillantes desenfocados, tales como gotas de agua, semillas de diente de león, o cualquier otra basura flotante, muy cerca de una lente y fuera del campo de visión de la otra. Cualquier detalle en las manchas será el mismo, como podemos observar en la adjunta comparación de dos de las manchas (el nivel de detalle lo marca la lente y la apertura). A 125 de segundo y con velocidad rápida, debería apreciarse un emborronamiento de los objetos en la dirección del movimiento. Nada de ello se pone de manifiesto. En conclusión, el consenso internacional de expertos no apoya otra realidad que no sea la virtual para los “ovnis” de estas imágenes. Existen contadas fotos ovni en 3D. La primera imagen estéreo se hizo en el invierno de 1870 en Mount Washington, estado de New Hampshire (EE.UU.). Después del ejemplo español de 1978, hubo que esperar al 22 de agosto de 1983, cuando dos fotos sacadas con una cámara estereoscópica se lograron en Polonia. Las últimas fotos de esta clase las tomó Ed Walters, de Gulf Breeze, de dudosa fama, quien uso una cámara NIMSLO en febrero de 1988. 1965 supuso un notable incremento en cuanto a denuncias de casos fotográficos. Ese alto nivel se mantuvo durante 1966 y fue incluso superado por los informes de la oleada de 1967. Los dos últimos años de este periodo mostraron una decadencia en el número de casos, aunque mantuvieron un nivel alto si los comparamos con los primeros años de la década. En cuanto a casos explicados versus inexplicados, hay en media una proporción de 50-50, que se mantiene básicamente constante durante los casos (+/-10 puntos de porcentaje), con la excepción de 1963, un año donde 25 de los informes explicados se debe a un único suceso, ocurrido el 28 de febrero sobre Arizona y atribuido a las numerosas series de fotografías tomadas de los efectos en la atmósfera del lanzamiento abortado de un cohete del tipo Thor Agena. Bella fotografía realizada por Ray Stanford en Phoenix, Arizona, a las 18,05 horas del 28 de febrero de 1963. Ray identificó correctamente la causa del anillo luminoso. Aparte de comprobar el marcado acento norteamericano del catálogo (el 40% de los sucesos procede de allí), FOTOCAT ha hecho un trabajo especial de recopilación de casuística en Argentina, Australia, Italia, Chile y, naturalmente, España, lo que explicaría sus crecidos niveles de aportación. Los actuales ratios de frecuencia a nivel de naciones no tienen valor comparativo. Los años “flap” resaltados (en terminología de la USAF, una condición caracterizada por un avanzado grado de confusión) no aparecen como un elemento común en los varios países estudiados. Así, 1967 fue el año más importante para los Estados Unidos, 1965 y 1968 lo fueron para Argentina, 1961 y 1967 para Italia, 1968 para España, 1966 para Inglaterra, 1969 para Australia, y 1961 para Japón. Un verdadero estado de confusión. Este trimestre dedicamos este espacio al anuncio de un nuevo libro de lectura y consulta muy recomendable. Se trata de la obra An International Bibliography On Some Luminous Transient Phenomena In The Atmosphere (Bibliografía internacional sobre fenómenos luminosos transitorios en la atmósfera). Los autores y compiladores de este trabajo colectivo de excelencia son los conocidos estudiosos italianos Renzo Cabassi, Roberto Labanti, Edoardo Russo, Massimo Silvestri y Giuseppe Stilo, miembros del CISU (Centro italiano para estudios ovni) y del CIPH (Comité italiano para el Proyecto Hessdalen). - Luces terrestres (Earth Lights), Fuente de San Telmo y Fuegos fatuos. - Luces de terremotos (EQL), precursores de seísmos, electricidad atmosférica, y la Teoría del stress tectónico (TST). De lejos, éste supone el más extenso trabajo de recopilación hecho hasta el presente relativo a este tipo de fenómenos y es el resultado de la colaboración entre proyectos activos en el seno de CISU y de CIPH. Recordaré que la versión 1 de mi ensayo en inglés apareció en http://www.ikaros.org.es/fotocat1954.pdf. La versión 3 fue la traducción española (incluyendo imágenes) que se publicó en la revista @nomalía (II), 5, mayo de 2005, y la versión 4 (también con fotografías) es la traducción francesa que apareció en el anuario La Gazette Fortéenne, IV, 2005, páginas 99-133. Las diversas versiones representan mejoras sucesivas respecto de la inicial. Nos ha escrito Santiago Delgado Ruiz para informar que él fue también testigo del suceso del 2 de junio de 2004 del que ya sabemos que se trató del lanzamiento de un misil balístico francés (ver este blog, octubre 2006). El observador se encontraba en la ciudad de Sevilla cuando quedó impresionado por esta visión aérea, de la que hizo el espectacular dibujo que reproducimos a continuación. Cualquier cretino puede crearse hoy una página web o un blog, por ello no vale la pena visitar muchos de los existentes actualmente. A mi juicio, una excepción es http://kevinrandle.blogspot.com/, el blog de Kevin Randle que personalmente me permitiría recomendar a mis lectores. Pedro León (a la izquierda) y Vicente-Juan Ballester Olmos, en su Estudio. El 1 de diciembre recibí la visita de Pedro León Sistach en Valencia. Pedro viajó desde Barcelona para una reunión de trabajo organizada en torno a las investigaciones que, junto con Manuel Borraz, llevamos ya realizando hace unos años sobre un significativo incidente ovni ocurrido en 1985 en Cataluña y que reúne filmación en video, intervención policial, detección radar y observación desde aviones. La jornada de trabajo fue muy fructífera y espero podamos informar resultados durante el año que viene.